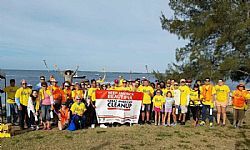 Our "Give A Day For The Bay" workday season concluded in May with a trash bash along the shoreline near the Blackthorn Memorial on the Sunshine Skyway Bridge approach. More than 70 volunteers removed 1,400 pounds of trash and debris. They installed 20,000 native plants! View photos from their volunteer workdays on their Flicker photostream. TBEP workdays will resume in September. Join their volunteer team by signing up here.